As you serve in faithfulness, your light shines for all to see. 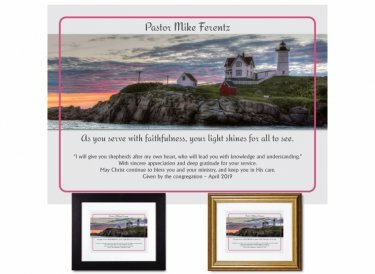 Unique pastor appreciation plaque features the iconic and beautiful Nubble Lighthouse on the coast of Maine. You'll personalize it with the name of your pastor, priest or lay minister - then add your own special message (the four lines of text at the bottom of the sample pictured here). Original design. Hand-finished using premium archival materials. Framed & Finished - Printed on premium paper with archival inks and double-matted with conservation-grade matboard as above; mounted using acid-free foam core backing; framed using distortion-free UV acrylic glazing. A protective dust cover and wall guards are applied to the back. Your choice of black or gold wood frame (view frames here); ready to hang. Finished size: 10"x12"
Custom created with your personalization upon order. Please allow up to 5 business days to complete.